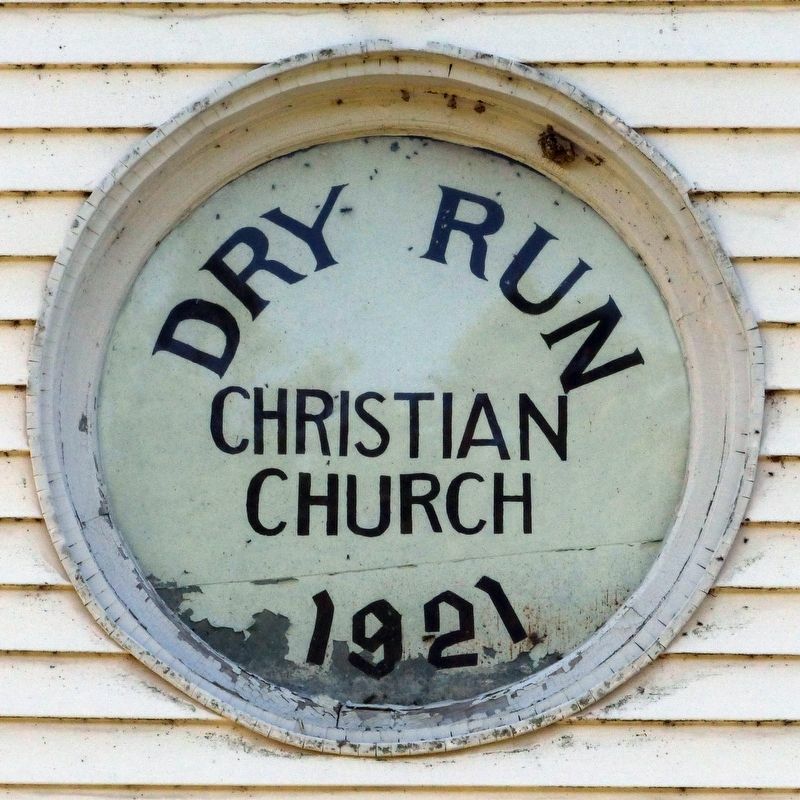 This building was erected in the year of Our Lord nineteen hundred and forty-nine by the Brethren of the Church of God in Christ Jesus, organized November 2, 1878 at Dry Run Meeting House. Location. 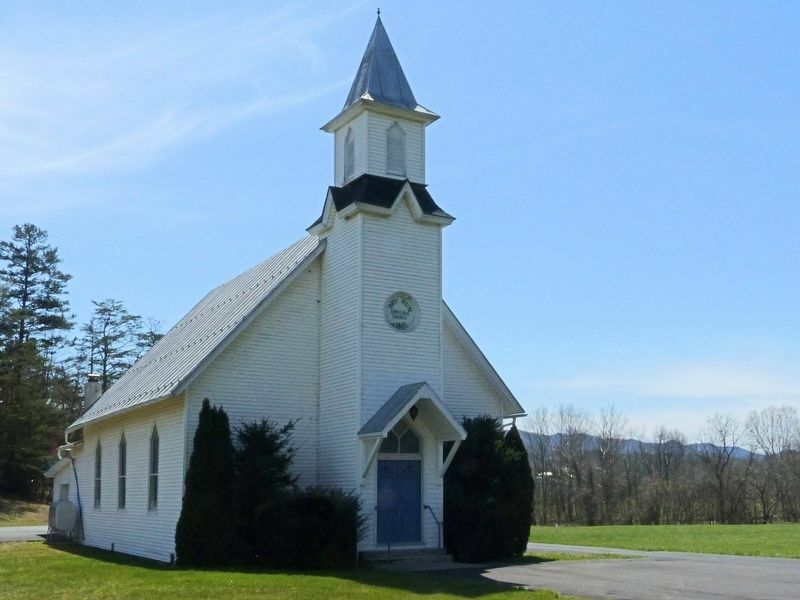 38° 51.622′ N, 78° 23.965′ W. Marker is in Fort Valley, Virginia, in Shenandoah County. 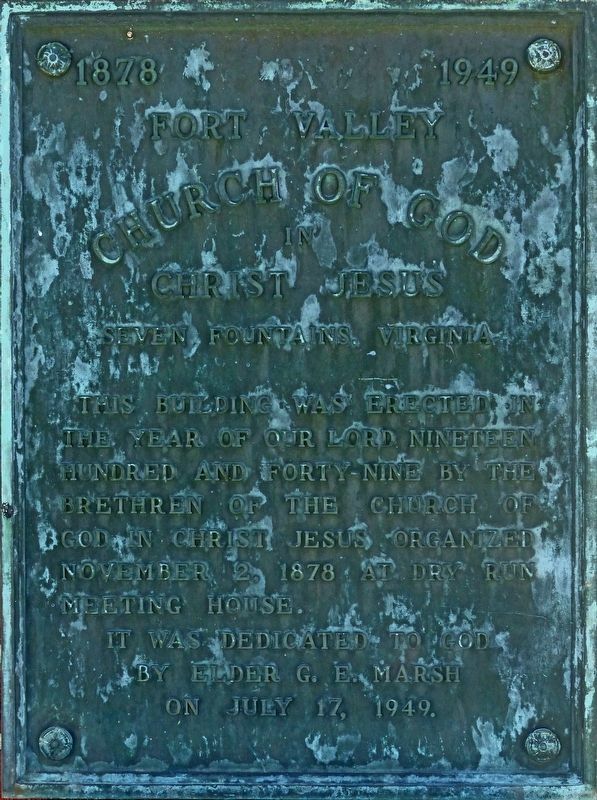 Marker can be reached from Fort Valley Road. Touch for map. 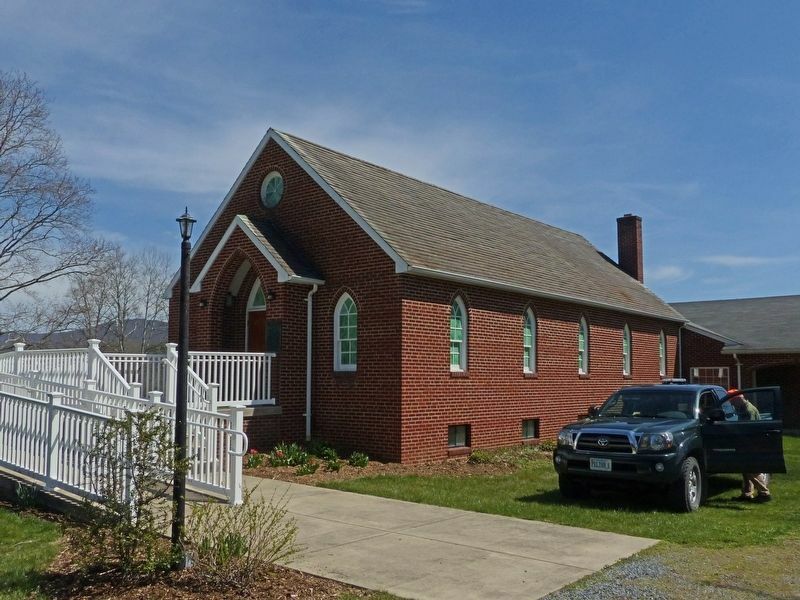 Marker is at or near this postal address: 8540 Fort Valley Road, Fort Valley VA 22652, United States of America. Touch for directions. Other nearby markers. At least 8 other markers are within 6 miles of this marker, measured as the crow flies. Overall Bridge (approx. 4.7 miles away); Battle of Milford (approx. 4.7 miles away); The Historic Page Valley (approx. 4.7 miles away); Warren County / Page County (approx. 4.7 miles away); Mt. 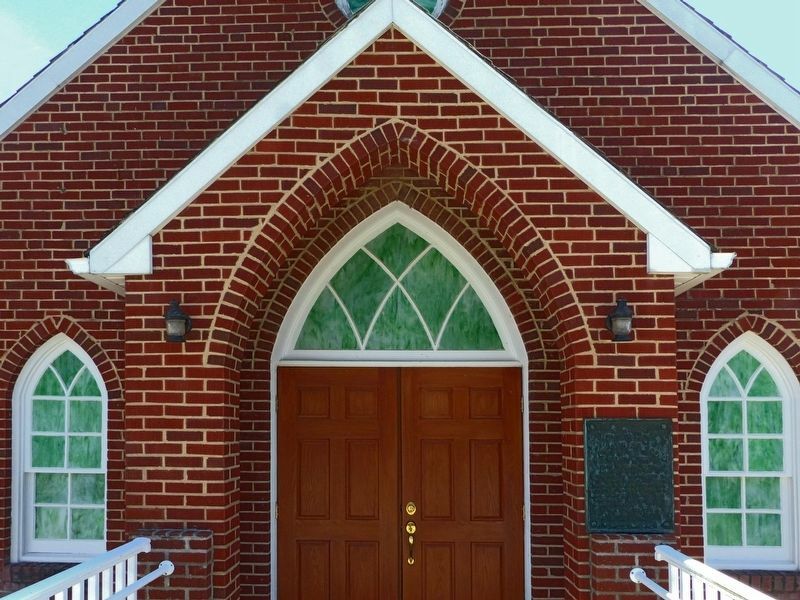 Zion Methodist Church (approx. 5.8 miles away); Woodstock (approx. 5.8 miles away); 1LT Charles Bare Gatewood (approx. 5.9 miles away); The oldest business in Woodstock (approx. 5.9 miles away). More. 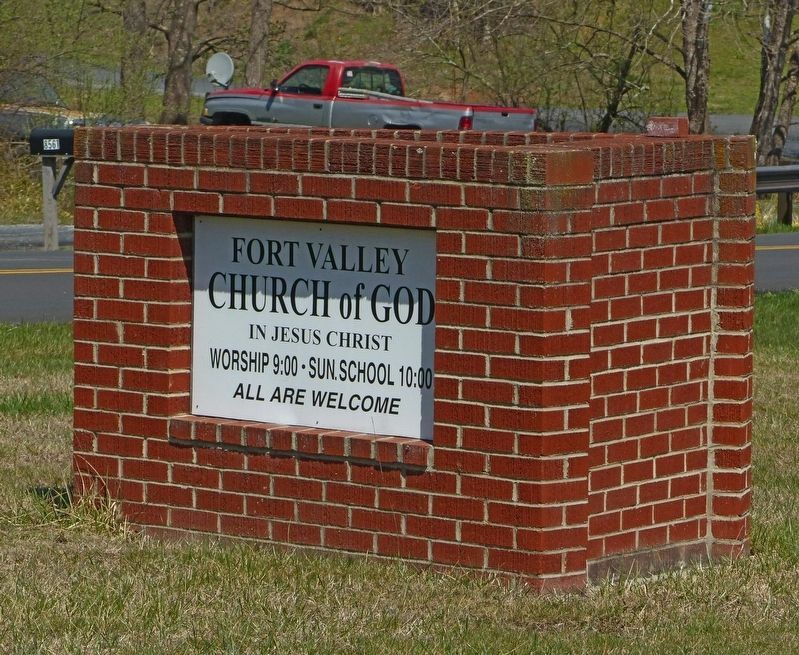 Search the internet for Fort Valley Church of God in Christ Jesus. Credits. This page was last revised on April 28, 2017. This page originally submitted on April 4, 2017, by Allen C. Browne of Silver Spring, Maryland. This page has been viewed 100 times since then and 4 times this year. Photos: 1, 2, 3, 4, 5, 6. submitted on April 4, 2017, by Allen C. Browne of Silver Spring, Maryland. • Bill Pfingsten was the editor who published this page.